One of the challenges I face in teaching carries some risk. That's the challenge of keeping the content refreshed, and bringing the same level of excitement each time I teach the course. I first taught each of my operational risk courses as "special topics," and have been teaching them as permanent electives for a couple of years now. Each of the courses lends itself to updates in the reading material, especially based on recent or current events. But for the students the challenge is in learning how to have a conversation about certain types of risk, how to make an individual assessment and then provide recommendations for a course of action. We use a couple of different kinds of skills in class: discussion among peers, facilitated discussions, presentation by example (myself, themselves, and our guest speakers); and writing for an executive audience. Along the way, we've had to deal with what it means to be present and contributing in class as a seminar member. I ask that students listen respectfully, with their laptops turned off, to the presentations. There are so many challenges for their attention, or for my own, that many of us who teach have reverted to showing them studies of how much more effective it is to take notes by hand rather than on the computer -- assuming that what you were doing was taking notes rather than (for example) checking Facebook or Twitter. There is so much pressure on students to do well that I think it's also important to stop and smell the roses along the way when you can. Today we're discussing a variety of articles, including several that purport to explain behavior, of both rogues and executives. What happens to the calm, rational process of decision making when you are under pressure? Do you take bigger risks or do you take the most cautious approach? I think you'd be surprised at what some of the studies say. I apologize for the long interval between my last post and this one. 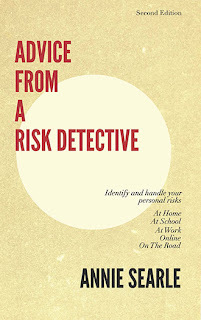 Those who've read Advice From A Risk Detective already have a good sense of what I advise in terms of your online privacy. But here's a short piece I wrote for a Seattle magazine, The Connector, that hits the high points.